Okay, first some truth. I love, LOVE, anything with the premise of fake dating. Books, TV shows, movies, or fan fiction. Whatever it is, if somebody in it fake dates to make someone else jealous, I am on board. 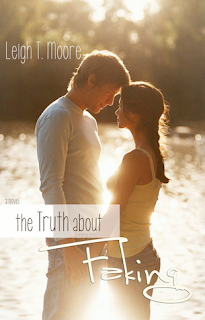 So when I got the opportunity to review The Truth About Faking, I was so psyched. The reason I love this plotline so much, is because it sets up a whole framework for excellent drama. Inevitably real feelings evolve, inevitably someone is super oblivious and it causes drama, inevitably it's got plenty of amusement for the reader. But enough rambling about why I love this plot device, and let's get to why I really enjoyed this book. Leigh T. Moore has done an excellent job with this storyline and she's even thrown in some extra twists. Initially, I didn't really care for Harley and her borderline stalkerish obsession with Trent. Girl needed to take a few steps back. Not to mention, she had a pretty big me, me, me attitude when it came to the help that Jason was going to give her. Of course, as the pages kept turn, I found myself warming up to her more and more. I really liked that the author also had a storyline regarding Harley's family, I think it's so nice when you get to see more into a characters life. I also thought it was really clever how she tied what was going on with Harley's family, into what was going with Harley. I love when you can see generational parallels. Oh, gosh this seems mouthwatering. Sounds like a great book to read when you're snowed in! Or, conversely, while you're laying out on a beach! Thanks for sharing!